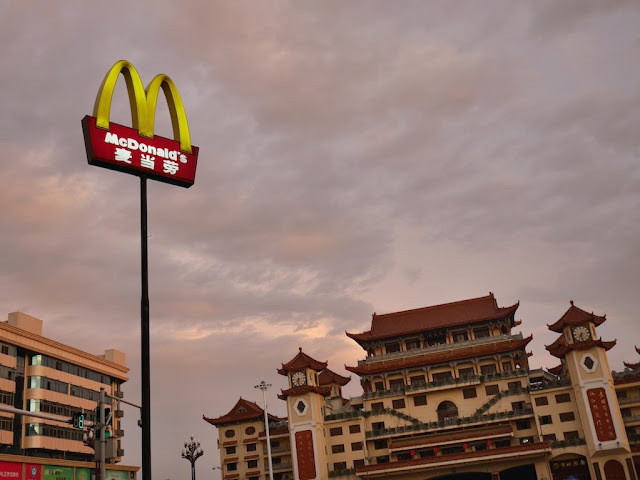 During my brief time in Changde, Hunan province, not only did I notice a hot pot restaurant with golden arches similar to the McDonald's logo, but I also saw a mobile food stall with another touch of American culture. 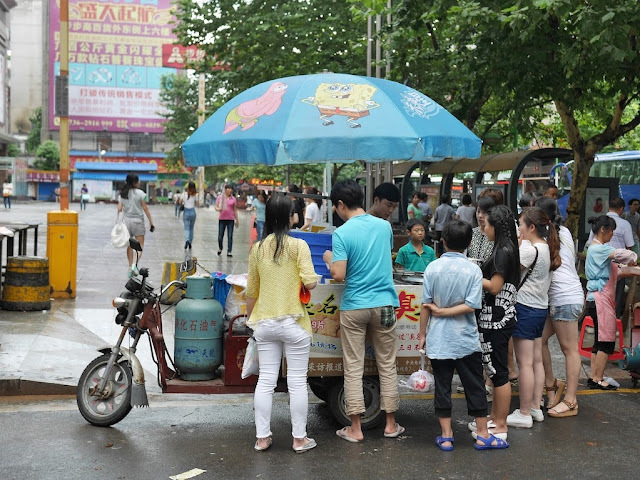 The umbrella promoted a Chinese brand of milk products for children — Mengniu's "Weilaixing" (未来星). I didn't ask how the umbrella made its way there, and such seeming mismatches are not a rare sight in China. Given the sole item being sold, I was mostly just attracted to the idea of SpongeBob SquarePants stinky tofu. In Changde, Hunan province, I was not surprised to see a sign with the well-known logo of a American fast food restaurant chain. I was also not surprised that a busy McDonald's could be found next to the sign. I was a bit surprised, though, to see only a short walk away a similar looking logo on a sign for the restaurant Moguofang (魔锅坊). The restaurant, located in an underground shopping center, also sported the familiar-looking logo on its storefront sign. 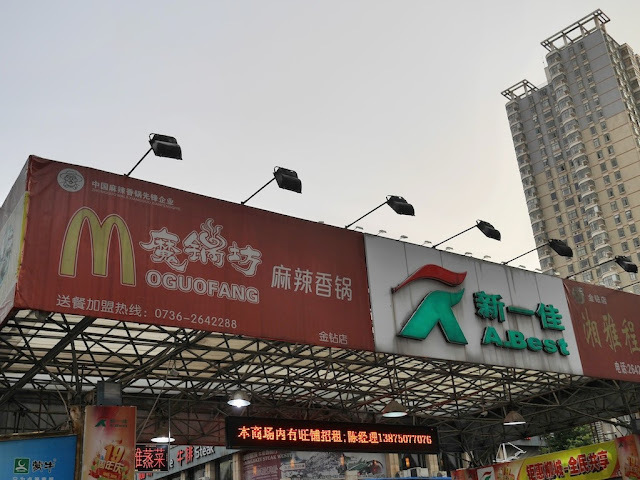 Moguofang's golden arches aren't exactly the same as the Golden Arches, but I doubt most people would be aware of any difference without directly comparing them. At least the apparently inspired-by-McDonald's restaurant, Wichael Alone, that I previously saw on a trip to Wuzhou had flipped the arches. The Moguofang example reminds me more of a restaurant in Shanghai with a logo similar to the one for Google+. 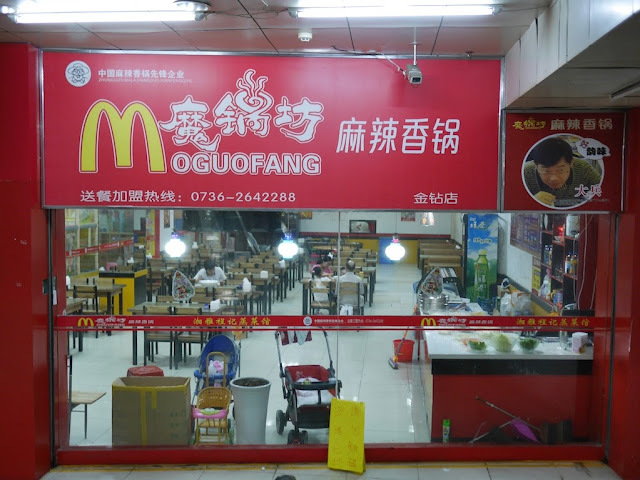 Moguofang is a restaurant chain and the questionable logo doesn't appear in any photos I have found online of its locations in cities such as Changsha and Shanghai. The logo also doesn't appear on the website for Moguofang. So it is possible the logo is just a local inspiration. Finally, no, you can't buy a Big Mac at Moguofang. But if you want a spicy hot pot, then you are in luck. Try asking for a McHotpot. Google+, like most of Google's other online services, remains blocked in China. 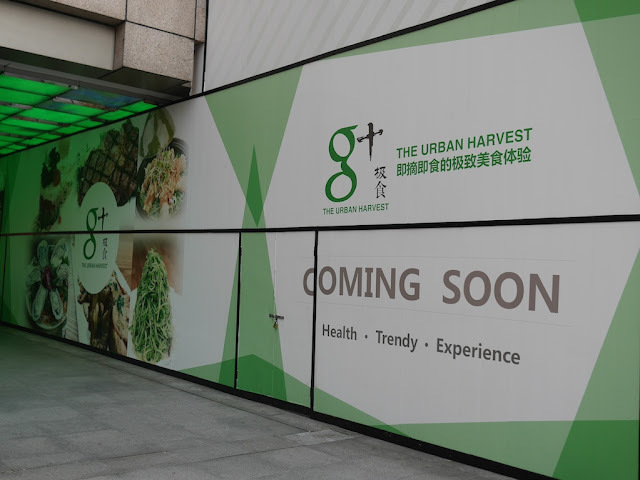 g+ The Urban Harvest is not blocked in China and will soon open another location in Shanghai at the popular Grand Gateway 66 shopping mall. Described on Time Out Shanghai as "equal parts open lab and restaurant", g+ The Urban Harvest states on Shanghai WOW!, "we believe that freshness and sustainability play key roles in maintaining a healthy and natural lifestyle". According to company's website, which at the moment is largely nonfunctional, the "g+" stands for "Green Plus". This is not the only time in China "g+" or "g plus" has been used as part of a name for a business, including some which existed prior to Google+. 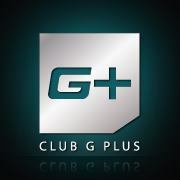 For example, the now-closed Club G Plus opened in 2006 in Shanghai and used "G+" in its logos. 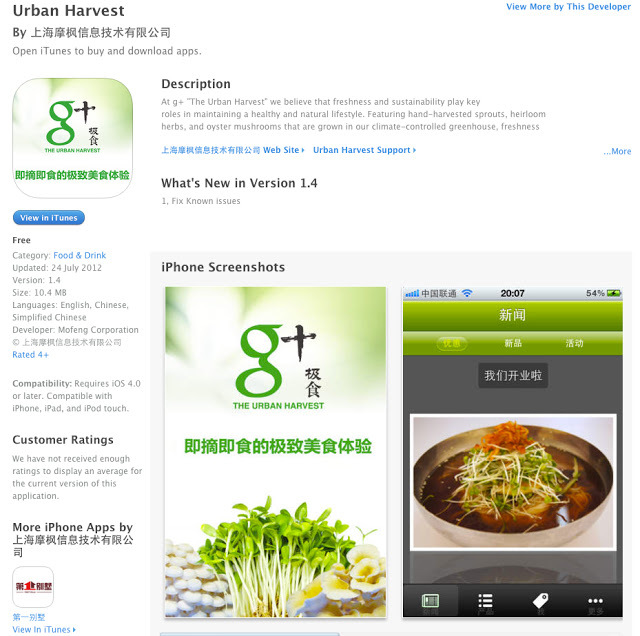 Nonetheless, the similarity of the g+ The Urban Harvest logo and the Google+ logo is remarkable. I can't add much more to this tale, but for more information about the restaurant you could download the Urban Harvest app on iTunes. Unsurprisingly, they don't appear to offer an app on Google Play. One day long ago when I was walking near the Washington Monument in Baltimore's historic Mount Vernon district, something passed by which made me feel like I was in a surreal dream. 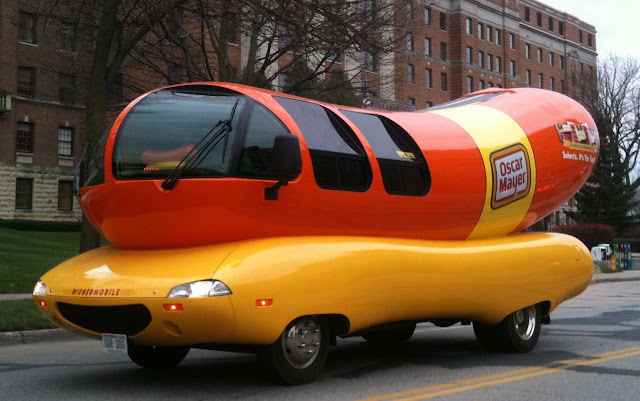 But I was indeed in the real world, and for the first time I saw one of the famous Oscar Mayer Weinermobiles. While I was in Shanghai recently for short period of time, a vehicle with a different theme similarly grabbed my attention. 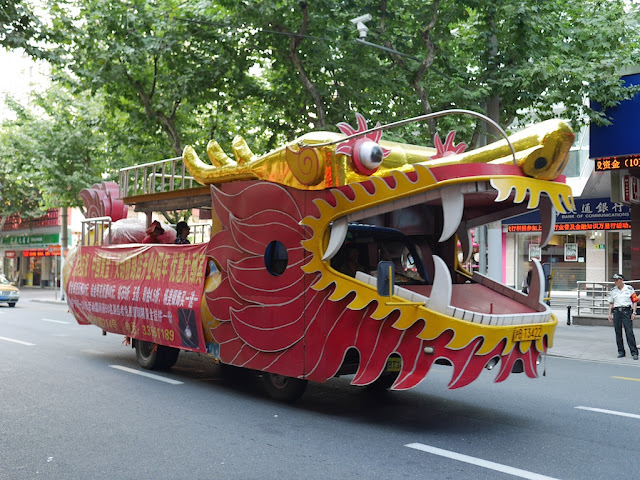 The "dragonmobile" displayed advertising for a nearby China Gold retail location in Xujiahui, and a group of people in the back played live music. The tune didn't seem as a catchy as the hot dog variation of Oscar Mayer's bologna song though. 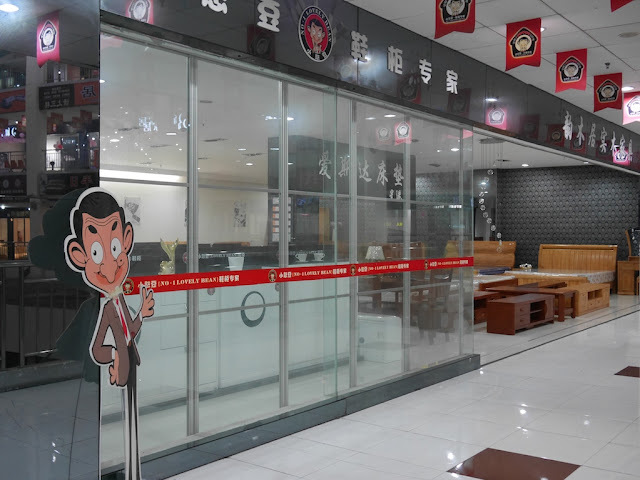 Mr. Bean can be appreciated for more than just the humor he provides, and the furniture store's branding raises issues about how Mr. Bean is perceived in China. It was not the first time I have seen a No. 1 Lovely Bean (小憨豆) store in China. The company (成都雄峰家具有限公司) is based in Chengdu, Sichuan, and they have shared photos of their team conducting assorted activities, perhaps in team or Mr. Bean spirit. You can learn more about the company on its website (in Chinese). 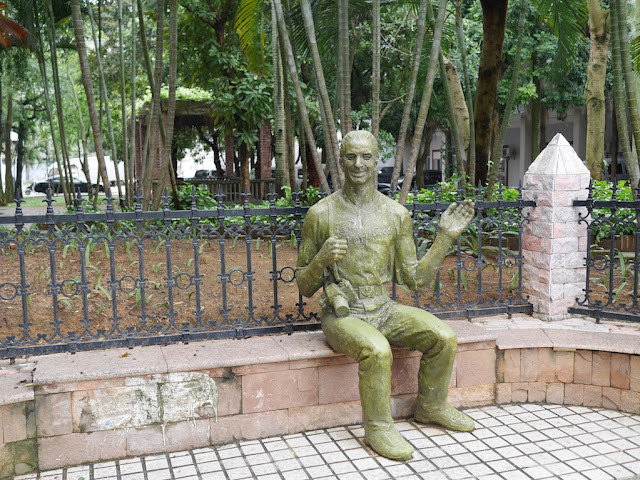 In Hengyang, Hunan, I have seen dogs taking a run, a ride, or sitting around in a park. 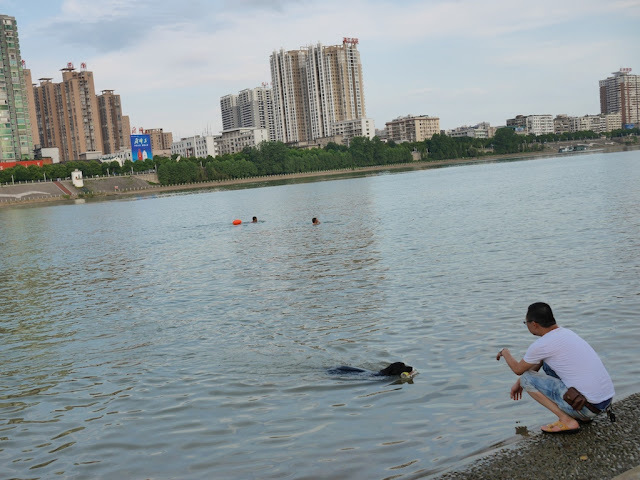 One day in Hengyang next to the Xiang River, I also saw dogs taking walk . . .
. . . and taking a swim. Just some more dog love in Hengyang. 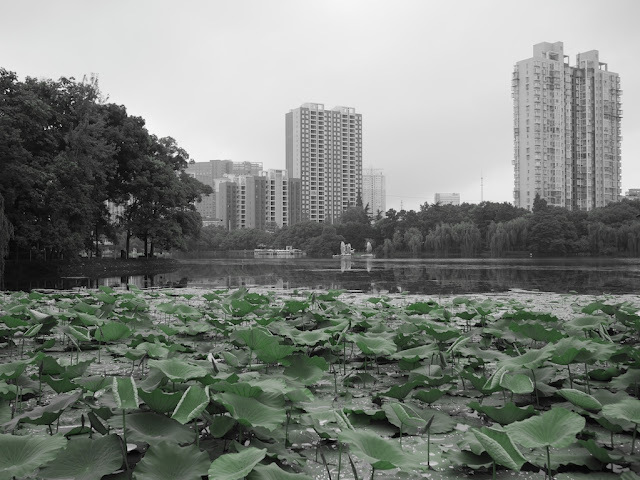 Now that I finally have a functioning laptop and access to the Internet with a VPN once again, here is a black, white, & green scene from Binhu Park in Changde, Hunan province. I pondered much as I walked around the park on Tuesday earlier this week. However, I did not ponder that soon my laptop's video card would suddenly stop doing what a video card should do, that I would not be allowed to use the computers at local Internet cafes, that flooding would cancel a night train I had no idea I would book later that night, nor much else related to several days of unexpected "fun" during which I was unable to post here. More on those stories and some of what they say later. In the meantime, I will take a few more moments to ponder my pondering at a now far away lake. 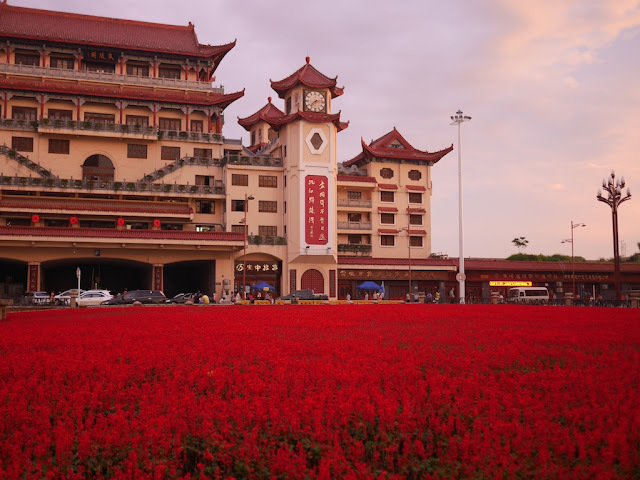 Despite only spending a couple of days in Hengyang during my first visit and the long period of time since then, I thought I could find the same location and see what it looks like now. Would the shoeshiners still be there? Like other comparisons of scenes from over two years ago and now in Hengyang, some change is noticeable. Most surprising to me was that I recognized one of the women. So I told her I had been there over 2 years ago, and she claimed to recognize me as well. Although I doubt I would have recognized her without having recently looked at the old photo, perhaps she did remember a foreigner taking her photo long ago. Whatever the case, after a friendly chat and a thorough "shoe shine", my sneakers almost looked like new. Many people in the world seek a happy zone. I had the pleasure to pass by one today near Lianhu Square in Hengyang, Hunan province. I didn't go inside Happy Zone, which I believe is an Internet cafe, but simply seeing the name brought me a bit of happiness. In case you are wondering, the English name is a direct translation of its Chinese name 开心地带 (Kāixīn Dìdài). 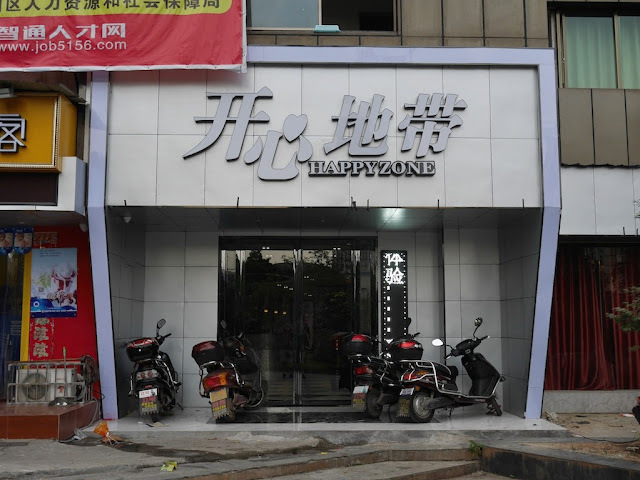 If Hengyang is too far away to visit, even for a zone of happiness, perhaps other establishments with the Happy Zone name, both offering karaoke, in New York and Houston are closer to you. 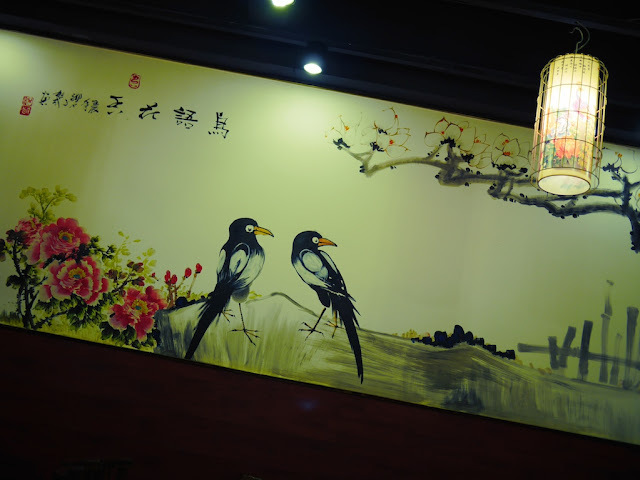 At a restaurant in Hengyang, I noticed a waitress's mobile phone. Instead of a Starbucks cup or an insect, it featured the image of a giraffe. And the phone was one of many examples I have seen suggesting that Vivo's presence in Hengyang is far more than just promotional marches. 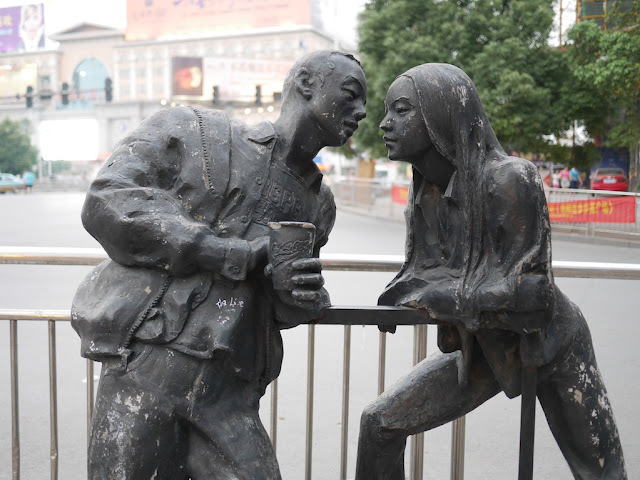 The above pair of statues, one holding a cup of Coca Cola, near the main railway station in Hengyang, Hunan province, reminded me of the statue below I saw in Zhanjiang, Guangdong province, wearing a shirt with the Chinese characters for "Zhanjiang" followed by "Very Good". I suspect there is an interesting story or two to tell here, but, at least for now, I will just say it was another unexpected connection. If I had been in Beijing, Hong Kong, or Shanghai on July 4th, I would have had many well-suited options for places to celebrate America's Independence Day. 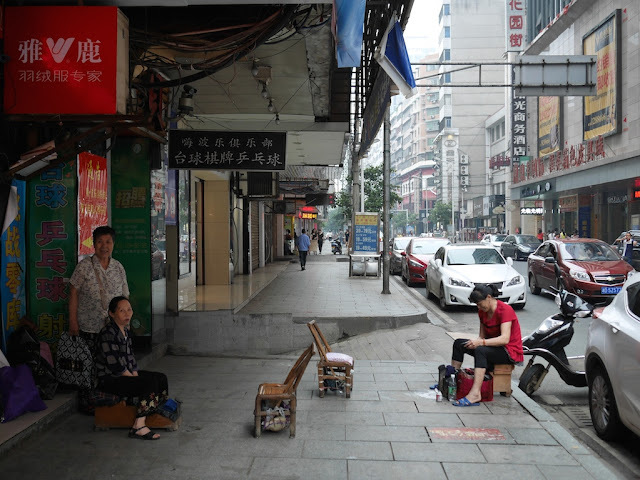 Off the top of my head, I can also easily think of such places in other Chinese cities such as Changsha, Kunming, Nanning, Xining, and Zhuhai. 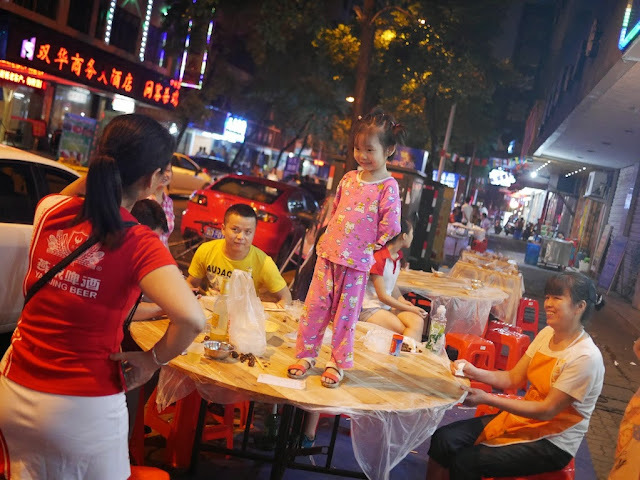 However, enjoying a bit of American spirit proved more challenging in Hengyang, Hunan province, and required some improvisation. My attempts during the evening to find proper American-style food not from a fast food chain restaurant were not fruitful. 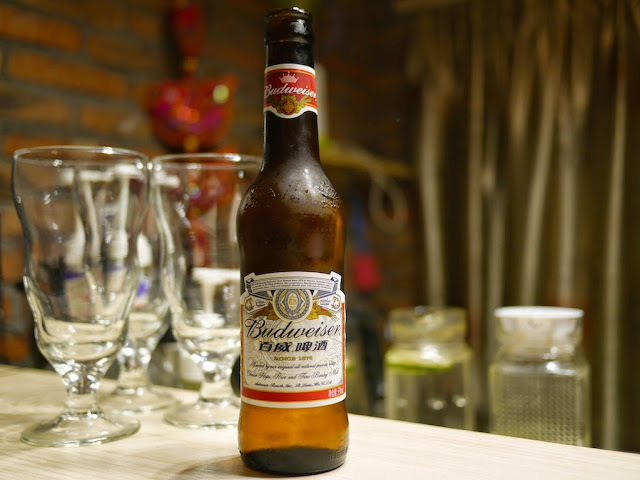 But a beer at a cafe caught my eye, and I decided to drink my first American Budweiser in a rather long time. Unlike Zhuhai, I have yet to see anything approaching a hoppy beer in Hengyang. 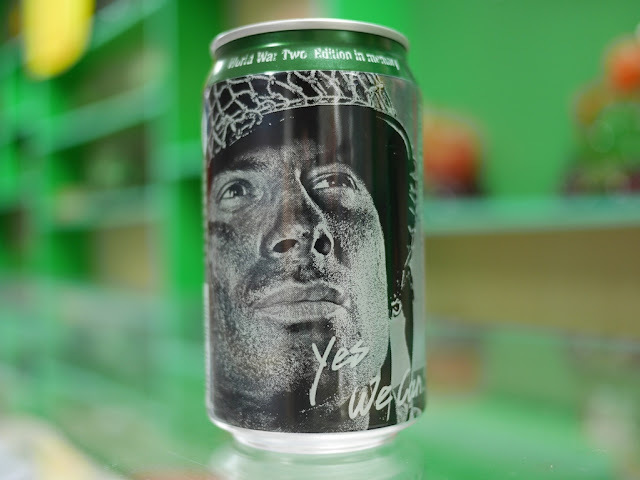 Not by design, I later continued the beer theme and picked up a Pabst Blue Ribbon World War II memorial beer with an explicit US military theme. 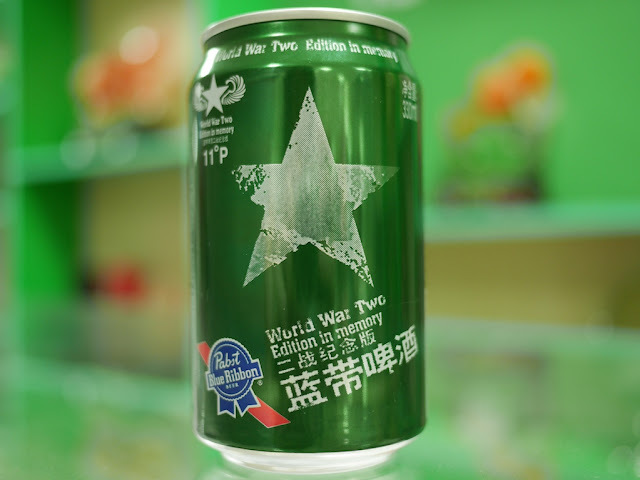 I first saw this beer in far away Changchun 4 years ago, and I still would like to speak with the team who designed the can. At the same supermarket, I picked up another item. 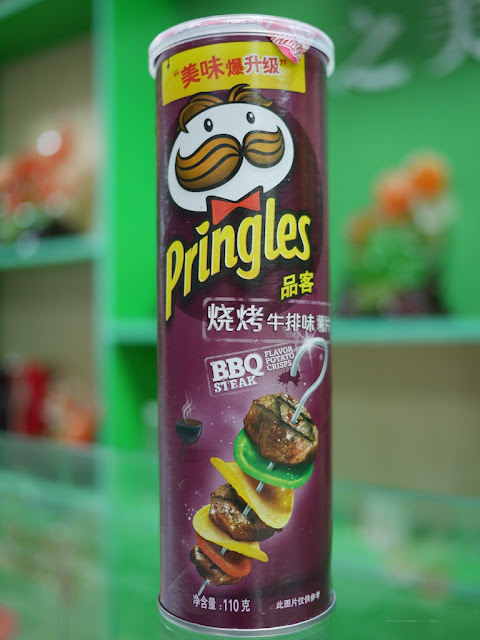 The BBQ steak flavored Pringles definitely had much more of a taste than the beer despite lacking a military theme. I wasn't sure how I could properly followup beer and potato chips. 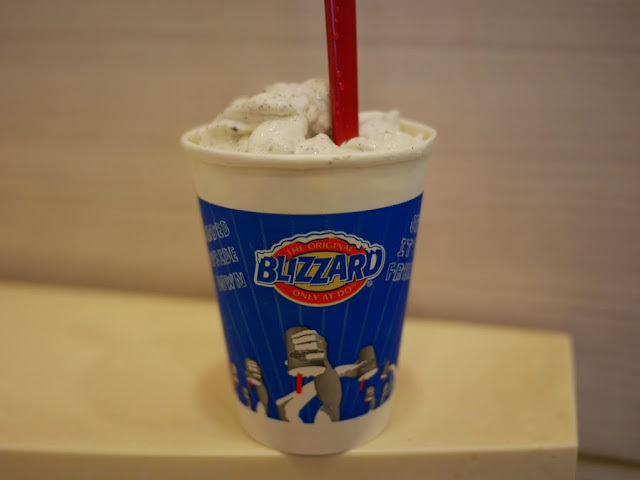 When I saw a Dairy Queen the answer became obvious—an Oreo Blizzard. I was now ready for the main meal. I thought my best option would be another supermarket where hopefully I could buy ingredients to make a peanut butter and jelly sandwich. But by the time I arrived it had closed. So I gave up on avoiding fast food and headed to KFC for some fried chicken to wash down the beer, chips, and ice cream. Protein, grains, vegetables, and dairy—a good American diet, right? After waiting in something approximating a line at KFC, the server explained it would be another 30 minutes until the fried chicken was ready. I can't quite put my finger on it, but there is something incredible about that. Whatever the case, I didn't want KFC that much. I decided to call it night. The earlier delights combined with a long walk in extremely muggy weather had decreased my appetite anyway. 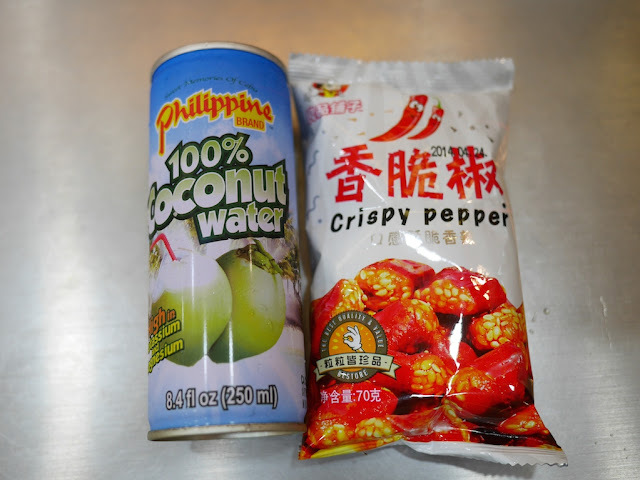 But later I noticed a store with a selection of foods similar to the Bart Simpson themed snack store, so I picked up something to top it all off—Filipino coconut water and Chongqing spicy peppers. I just pretended I was enjoying freedom water and freedom peppers. Tomorrow I will share a little about how I celebrated America's Independence Day. For better or worse, it did not involve me dancing on any tables. Two days ago in Hong Kong, thousands joined a pro-democracy march. On the same day I saw a group of people in Hengyang, Hunan province, also marching down the street. I feel safe saying democracy was not at all on the their minds, though. 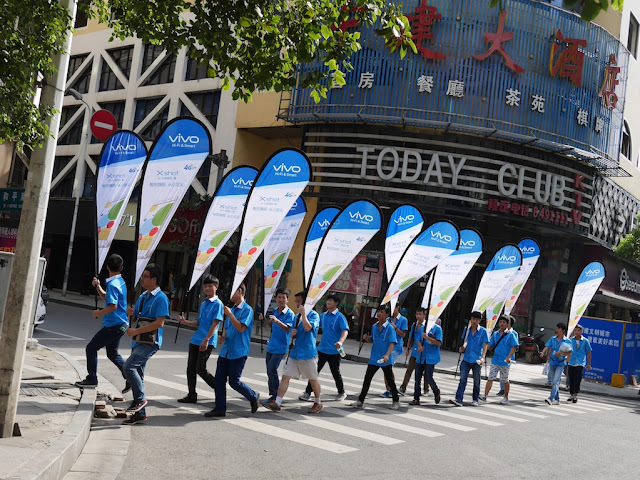 Instead, the march was part of a promotion for Vivo mobile phones. A few minutes later, I saw another group of people who were taking a break from their own march. Again, it had nothing to do with democracy. 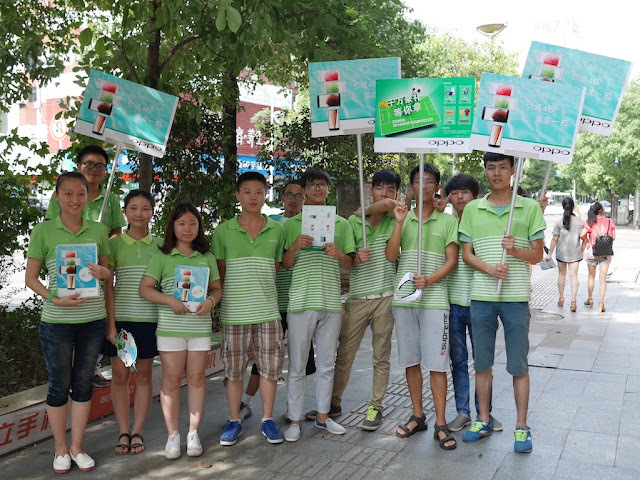 Again, it was a promotion for a mobile phone brand—this time Oppo. 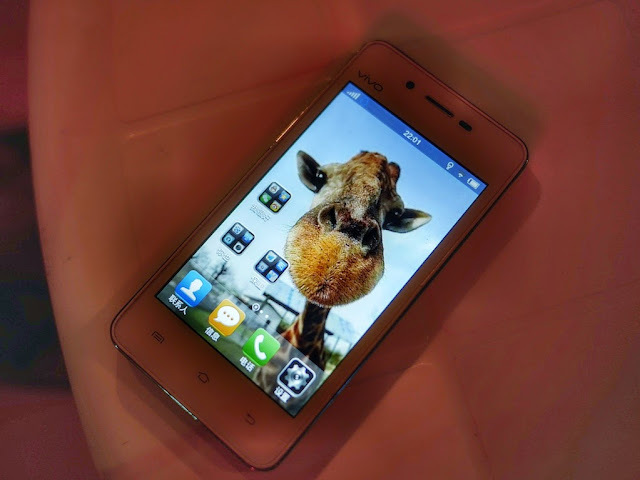 Vivo and Oppo are two Chinese brands of mobile phones often not mentioned in discussions of China's mobile phone market. 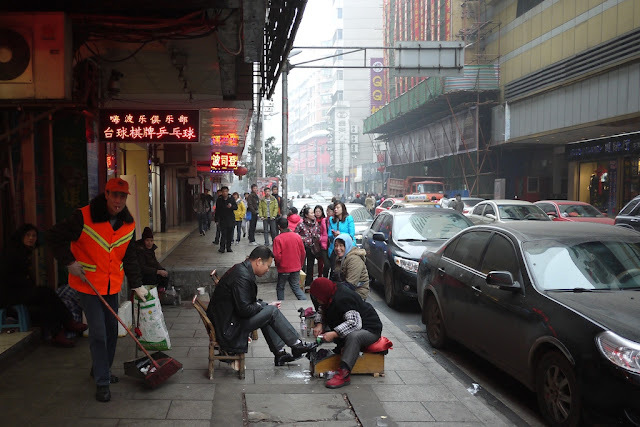 Yet as the above scenes suggest, in some parts of China their presence can be easy to see. 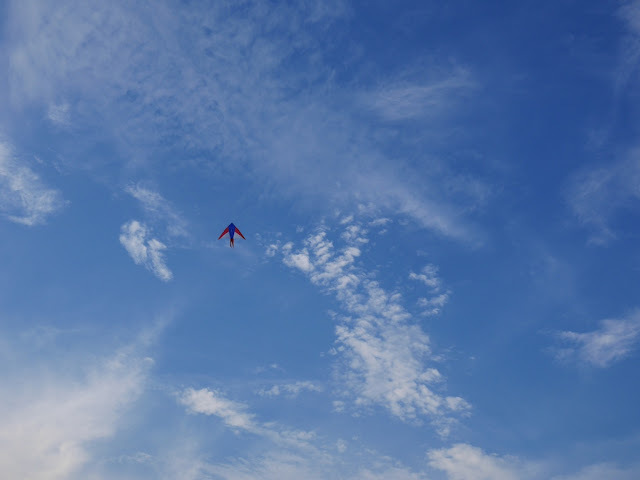 Blue skies in Hengyang have not been frequent during my time here, but fortunately today was another exception. 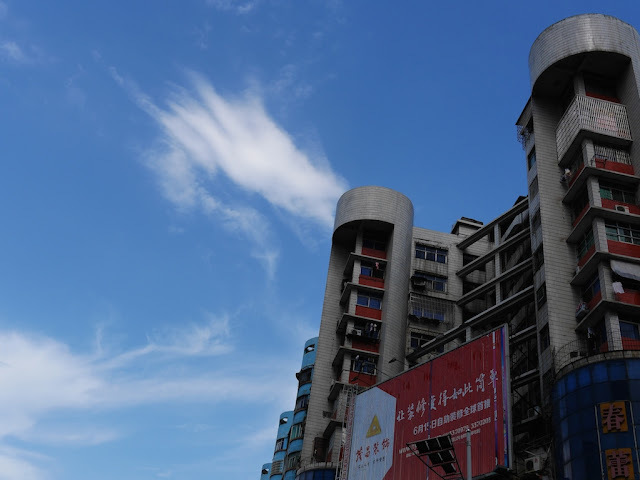 More about blue skies (or lack thereof) elsewhere in China, mobile phone sales, and other topics soon . . .